One of the more mundane items that needs to be procured for the extreme macro flash studio is some flash arms/clamps/supports to keep your flashes in place whilst you're taking your shots. And flash arms can be a surprisingly expensive item to buy which seems a little bit silly for a thing that's just supposed to keep your flash from moving. 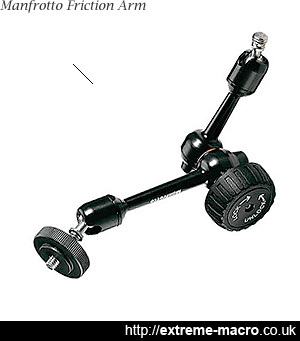 Manfrotto hydrostatic flash arm, 7" long. The Manfrotto unit comes in for a lot of praise by the people who use it, and isn't quite as expensive as some of the other arms on the market. Expect to pay upwards of £75 for one. It's worth having a good think about the mode that you intend to use your flashes in when looking for flash supports. As crazy as this sounds, if you intend to use wired *TTL metering or PC-sync then you'll need flash supports that support these by having the appropriately wired end. Personally I have moved onto a manual wireless flash system triggered by 1 PTTL flash so cords and connections are now no concern to me, but previously when I used PC-sync I had to make sure that the ends had the right female connecters to wire in the male PC-sync cable which allowed the flashes to be triggered. Noga friction arm, the Rolls Royce of friction arms that are available commercially. These cost a three-figure sum, but provide the most secure hold of all the commonly used arm brands including Zeiss and Manfrotto. Variable friction arms come in various guises and from various manufacturers. They're normally used for flashes but can also be adapted to act as a diffuser holder. Manfrotto or Noga arms are the highest quality but they're also the most expensive. Manfrotto hydrostatic arms come in for a lot of praise, locking rigidly in place. The single locking knob variety is the easiest to use, and for a budget version look no further than the eBay friction arms. These do sag a little but they're perfectly usable if you don't fancy spending a three sum figure per arm. 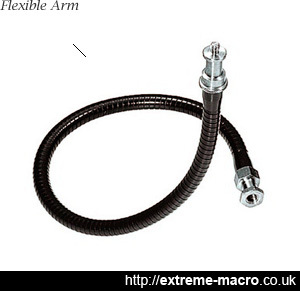 Manfrotto flexible arm 237, broadly similar to the flexible arms I bought from eBay with which you can make your own flash supports. You can also make your own flash clamps by buying separate components from eBay and putting them together. This is the path I took and whilst I have no complaints I suspect they're probably not quite as nice to use as some of the other ones I've seen in use. The bits I used were a black gooseneck macro flash arms made out of metal, which have a screwed thread on both ends, similar to, but not the same as microphone goose necks. Together with a magic clamp, a threaded cold shoe and mini tripod ball head, it's quite handy and can be adapted to fit the flashes to a breadboard should I ever decide to purchase such a thing. Or, alternatively, to magnetic bases, which are nice to haves should I decide to go that route. Of course you can also use perfectly standard small plastic flash stands which often come supplied with flashes. These are fine when your flash sits on a desk or so but they're obviously no good for suspending your flash above a specimen. There is an intermediate option between wireless dedicated flash and wired PC (or equivalent) flash for manual off-camera flash. Slave hot shoes have a light sensor which will detect the light from a flash triggered by the camera and fire its own flash. You can use as many slave hot shoes at a time as you have flash guns.